Van is a very special Siberian who we are extremely proud of. He came into Rescue almost two years ago ~ a middle age, low-key Siberian we all fell in love with. Shortly thereafter, he was diagnosed with Perianal Gland Cancer. We were devastated, but were assured it was treatable with surgery and chemo treatment and Van would not experience adverse reactions. It was very expensive, but we couldn’t say no to Van. Van has been cancer free and in remission 19 months! He does need to be checked periodically to make sure he remains cancer free. 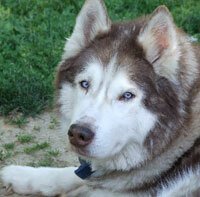 He is a wonderful, affectionate Siberian and his foster mom calls him a “Siberian throw rug”. He is just happy to be near you and hang out or share a good movie. “Van Man” or “Big Red” ~ any name you want to call him, this guy is a trooper and real winner!! He has won his battle with cancer and now he only needs a permanent home to call his own. Please feel free to contact us for more information and details about Van. Our heartfelt thank woos to everyone who supported Van and sent well wishes and sibe vibes. Thanks to you, we are able to help these wonderful dogs. An extra special thank you to Dr. Jeglum and Veterinary Oncology Services and Radiation Center of West Chester and Chalfont for taking such wonderful care of our special sibe!